In Gamers at Work, 18 game industry leaders and pioneers reveal how they play the odds, seize opportunities, and transform small businesses into great businesses through entertaining stories, humorous anecdotes, and lessons learned the hard way. Within these pages, you will find their stories replete with their personal struggles, corporate intrigue, and hardwon insights you won't find anywhere else. 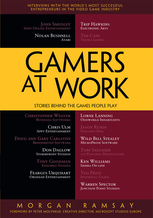 Gamers at Work is sold in digital and print formats at Amazon, Barnes & Noble, and other bookstores. We recommend you buy the book from the publisher. You can buy a signed copy direct for $20.00 USD. The shipping fee is included. Books are shipped via Media Mail. Due to shipping costs, international orders cannot be fulfilled. In Online Game Pioneers at Work, 16 founders of major game developers and publishers in the online games space reflect on the challenges they had to overcome and the sacrifices they had to make to succeed in this incredibly competitive market. For the hundreds of thousands of game developers out there struggling to stay alive in this volatile industry, this is a must read survival guide. 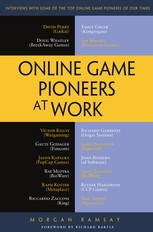 Online Game Pioneers at Work is sold in digital and print formats at Amazon, Barnes & Noble, and other bookstores. We recommend you buy the book from the publisher.